OS grid reference: NL 9988 4678. At the north side of the island and just south of the B8068 coast road to the west of Balephetrish village in Vaul parish stands a large glacial erratic boulder called ‘The Ringing Stone’, which has many prehistoric cup-markings in it’s surface. It is known in the Gaelic language as ‘Clach a’ Choire’ and, also ‘The Gong Stone’ due to the ringing, metallic noise that eminates from it when struck. There are a number of legends associated with the stone, most of them being a bit far fetched. 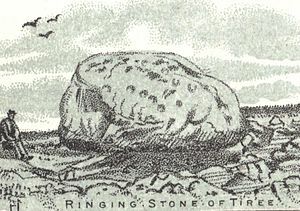 The Ringing stone (Clach a’ Choire) is a large round-shaped granite, glacial erratic boulder that sits on top of a plateau of rocks just to the south of the B8068 coast road, near Balephetrish. It was brought here from the island of Rum at the last Ice-Age some 11,000 to 13,000 years ago. In the Neolithic period 4,000 to 6,000 years ago it was carved with literally dozens of cup-marks, too numerous to even try to count. But obviously the ancient people from the Neolithic, and later the Bronze-Age, also found it to be “a mystically symbolic stone”. The boulder is perched on tiny little pedestal-like rocks that themselves sit on top of rocky surface. Apparently, when the rock is struck a ringing sound eminates from it, or, a metalic sound as if it contained a crock of gold coins maybe! According to legend – and there are quite a few, if the stone is ever split assunder the island of Tiree will disappear beneath the waves. Another says that if the boulder were to shatter and fall from it’s pedestal of stones which it rests upon, then Tiree will sink beneath the waves. And, lastly there is a tall tale often told on the island that there is a crock of gold coins inside the stone – hence the ringing sound when the stone is struck! Kennedy, Donneil., The Land below the waves: Tiree past and present, Tiree Publishing Company, 1994. Categories: Clach a' Choire Stone Balephetrish Tiree, The Ringing Stone Balephetrish Tiree | Tags: The Ringing Stone at Balephetrish in Tiree Scotland | Permalink.